Once again Alex Randolph is back to the boardgames scene with a new boardgame, and this time he released the game on time with his 75th birthday. And indeed, he brought us a nice birthday surprise ! Halunken & Spelunken (H&S) is a short boardgame for 2 to 4 players. Each player takes the role of a ship´s Captain who tries to find a suiting crew for his ship. Due to the large number of ships existing in 1750, good crew members were hard to find in the english ports. So it´s the Captain´s turn to visit the harbour taverns and pubs in order to round up some people for his crew. The gameboard shows an english harbour at night. 14 taverns form a circle around the harbour-basin, and at the beginning of the game each tavern contains 3 different random people who wait for a Captain to join his crew. So each of the players choses one of the taverns as his starting points, takes there the uppermost crew-member, and then goes off in search for more. For movement, each player has a set of 8 movement cards (1-7 and a barrel of Rum) which he might play to move his Captain a number of taverns clockwise on the board. 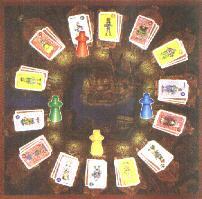 During a turn, each player secretly plays one of his movement-cards, and then all players turn their cards over. Now first the player with the lowest card played moves his Captain and takes a new crewmember (if possible) at the tavern he arrives in. The the player with the second lowest card follows etc... Have two or more players played the same card, all of them must stay in place that round and take one more crew-card at their present location. Comes a player to a place already occupied by another Captain, he pushes this Captain forward one space and, if the pushed Captain has more crew-members than the "pusher", may take one of his crew-members. The Barrel of Rum is something like a joker-card. It may be used to move the Captain any number of spaces from 1 to 7. The more the game progresses, the higher becomes the strategic potential for the players. As with most Alex Randolph games, H&S, too, offers a good amount of tactics for the players: Which cards have the other players played ? Which cards might still be in for Black Jack ? Which movement card should I play ? A number to reach a lower crewman ? Should I go for a valueable crew-member ? Or should I try to play the same card as an other player in order to stay where I am and collect a second crew-member here ? The game has a very fitting design, with a dark harbour and bold-looking crew members, and it´s exspecially fun to play with the full amount of 4 players. But Alex Randolph has also thought of small gaming "groups", and thus he has added a special rule for two players which still increases the tactical potential of the game. Thanks, Alex !